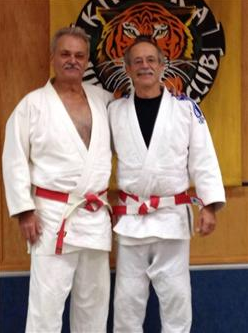 Anthony M. “Tony Grisanti, long-time sensei of Kin-Tora Judo Club in Buffalo NY passed away suddenly June 17, 2914. Anthony M. “Tony” Grisanti, a longtime judo instructor and president and owner of Grow With Us Day Care on Niagara Street in Buffalo, died unexpectedly Tuesday in his office. He was 63. Born in Buffalo, he was a 1968 graduate of Kenmore West High School. After earning an associate’s degree in electrical systems from Erie Community College, he became facilities engineer at Hauptman Woodward Medical Research Institute. He took up judo as a youngster with his late father, Salvatore, his sister and his brothers. After obtaining his black belt, he and his family opened the Kin Tora Martial Arts Center in 1974. In 1997, he and his nephew, Nicholas Rastelli, opened Grow With Us Day Care. With his brother, Martin, he expanded it to two facilities serving more than 120 children. He became an international judo referee, traveling to tournaments in England, France, Germany, Brazil and Abu Dhabi. He achieve the rank of Rokudan sixth-degree black belt. Grisanti-sensei’s obituary is below and you may click here to leave your own condolences. GRISANTI – Anthony M. “Tony” Age 63 of Buffalo, NY suddenly June 17, 2014. He is survived by Joyce (nee Herkimer) Gugino his best friend, love of his life and rock for the past 40 years and three cherished stepsons Robert (Susan) Gugino, William (Renee’) Gugino and the late Michael Gugino; devoted son of Doris (nee Dry) Grisanti and the late Salvatore Grisanti; wonderful brother of Carol (late Nick) Rastelli, Martin (late Lynnette) Grisanti and Robert Grisanti; also survived by grandchildren and numerous nieces, nephews, great-nieces and great-nephews. Friends may call Friday from 4-9 PM at the JOHN O. ROTH FUNERAL HOME, INC., 25 William St. (between Morgan and Broad Sts.) in the City of Tonawanda. Funeral services will be conducted on Saturday at 10 AM in Immanuel Lutheran Church, 107 Scott St. at William in the City of Tonawanda. Friends invited. In lieu of flowers, memorials may be made to Immanuel Lutheran Church Memorial Fund. Tony was President of Grow With Us Day Care, Co Owner of Kin-Tora Judo Club, Sixth Degree Black Belt, International Judo Referee, Vice President of New York State Judo and President of Niagara Yudanshakai Black Belt Assn. This entry was posted on June 20, 2014 at 6:55 am and is filed under Judo News. You can follow any responses to this entry through the RSS 2.0 feed. You can leave a response, or trackback from your own site.